Gopadevi/Krishna tells someone among them who is very powerful and warrior must have betrayed. Jatila says her son is only warrior here and if she is pointing at Ayan. Gopadevi says she did not mean to point at super human Ayan. Radha says why we are doubting our people, maybe an outsider came in disguised. Vrishbhan says she is right, they all should be careful. Radha says only Gopadevi and Baldevi are outsiders here and problems started once they came in here. Baldevi cries that they risked their life and protected her, she is alleging them wrongly in return, asks Vrishbhan if this is what they get in return, they better leave from here where they are not respected. Gopadevi/Krishna via telepathy tells Baldevi that they tried hard to enter here and cannot go easily. She acts and says let us go from here. Vrishbhan stops them and says they don’t have to go from here and tells Radha that they risked their life and saved her and worked so hard, why would they have done this if they were traitors. Kirtida apologizes on Radha’s behalf. Gopadevi/Krishna says she does not have to, she is pity on Radha who is betrayed once and lost trust on everyone. Vyomesh, Ayan, and Jatila via magical illusion inform Kans’ aide Akroor about Gopadevi and Baldevi spoiling their plan and rescuing Radha. He asks who are they and why Krishna is still silent after so much happened. Jatila says they don’t know where are they from. Vyomesh says sthey are missing something and need to find out. Gopadevi and Baldevi’s discussion starts next morning. Baldevi asks why don’t she finish Vyomasur. 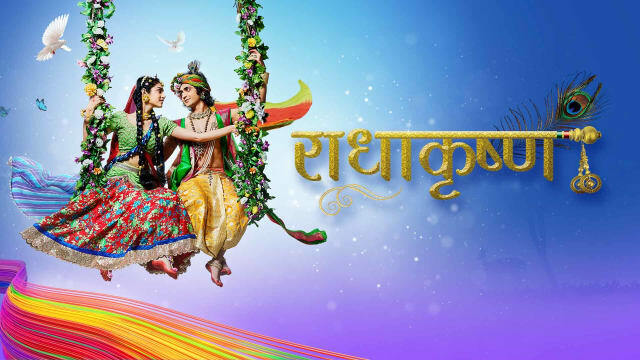 Gopadevi/Krishna says he cannot as doubt will direct go towards their father and Vrindavan. He is worried for Radha as she has to get rid off her anger soon. Dhama walks to them with gifts for Baldevi. Baldevi gets nervous. Gopadevi/Krishna says he will handle. Dhama says he is proud of brave woman Baldevi who is example for all women, he loves her and wants to marry her. Gopadevi walks away saying he will come back after meeting Radha and walks away. Dhama continues expressing his love for Baldevi. Baldevi says she cannot marry him as she has taken oath to be spinster whole life and serve humanity. He says that is a noble cause and needs male help, he as life partner will support her noble cause whole life. Baldevi gets tensed thinking how to shoo him away. Krishna gives moral gyaan that nature has filled hunger in each living being which lets them continue to work hard, but if human have only hunger, they have even greed and conserve wealth for their children and make them incompetent, so if they have to conserve, they should conserve knowledge and love. Precap: Krishna says even Radha that could not identify him. Radha enters and asks if he really thinks so, he considers her as arrogant and angry, now he will see her anger and she will punish him in front of everyone.